Gosh it has been awhile that I did not update my blog. There was a saying , if a blogger suddenly sort of disappear , it might mean either get back to work ( normal work life) or adding another family member in the life. ^__^ by the kindness of GOD, I am currently pregnant with the bundle of joys . Never do I know pregnancy can make so much difference in my life. I was mostly tire and sleeping super early most of the nights. By 8pm , I am totally gone. If I still able to stay awake is just because I might be eating or trying hard to keep awake till another half hour to be knocked off again . Having to work and body changes is no something I used to cope. Well, I shall not "complain" is another phrase of life , me and my hubby are journey towards. This cake has been make in April to celebrate the birthday of a group of guys !! Ya ! in total we have about 5 people born in the month of April . We notice those we born in the month of April seem to be talented in art , most of them are musician in our midst. 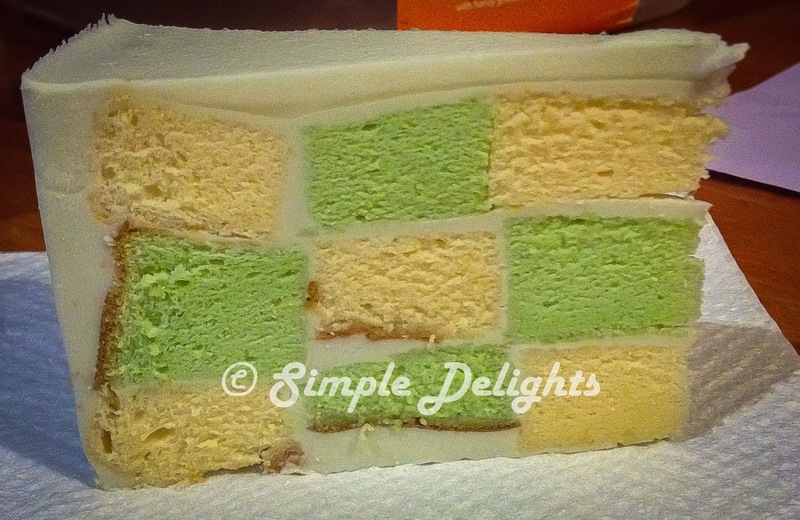 I thought of making a checkerboard cake but instead of doing what I have done before ( the not very successful attempt ->orange-chocolate-checkerboard-cake) I decided to have the flavour change to what we all love, pandan checkerboard. So here is the recipe I used from -> NasiLemakLover Basis Sponge Cake. I love the texture of this sponge cake and have been using this for most of my cake. 1. Preheat oven at 140C . 4. Add in cake flour mix well and set aside. 5. In a clean mixing bowl , combine egg white with cream of tartar , beat with electric mixer. 6. Add in the caster sugar ( 60g) gradually , beat till stiff peaks but not dry . 7. Mix 1/3 of the egg white mixture using hand whish with the egg yolk mixture till light. 8. Fold in the balance of the egg white in 2 portion into the egg yolk mixture until well combine. 9. Pour the batter into the pan and bake at 140C for 25min at the lower rack . Increase to 160C and bake another 30min. Till insert the cake tester is all clean . 1.The oven I am using is pretty hot so the temperature I used is according to my oven . 2.The cake pan used should not be non stick pan and I only line the bottom of the cake pan. The reason not using the non stick pan is for the even rising of this cake. 3.For even tone of baking and rising , this cake should be cake in low temperature at first then increase it heat. At lower rack. 4.If you follow the step , the cake will not crack at all. That is why I said this recipe is a winner among all the sponge cake I have tried. 5. To make a vanilla sponge cake just have the pandan essence replace with vanilla extract. 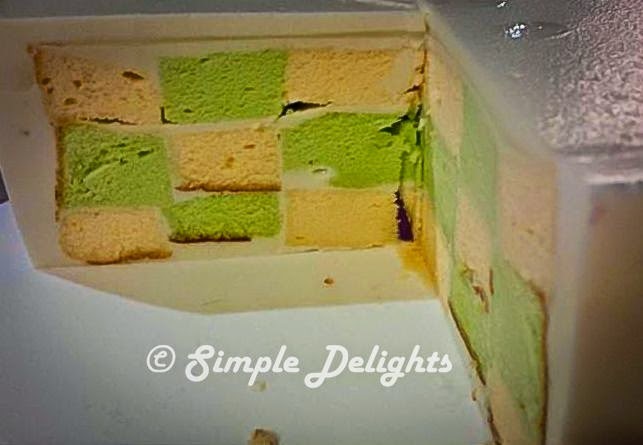 To make this checkerboard cake , I make 2 sponge cake , once is pandan sponge cake another one is vanilla sponge cake. Each cake need to be slice into 2 layer. I did not take pictures on how to assemble the cake. I am sure if you google the checkerboard that is heaps to follow. Or you can jump back to the above post follow Wendy instruction . For the coating I used Coconut Milk with white chocolate cream. As this is a 3 layer cake , hereby is the measurement for this 8" round cake. 1) Pour 6Tbsp of water in a bowl, sprinkle 3 Tbsp gelatin on top of it and let it bloom. 2) In a saucepan, combine the coconut milk and cream. Bring it to a boil and simmer for one minute. 3) Remove the pan from the heat and add the white chocolate and gelatin. 4) Stir the chocolate and gelatin until completely dissolved. 1. Put the cake layer in the cake ringform mould. Slowly pour in the 1/4 cup of coconut milk cream. 3. Place the 2nd layer of cake on top of the 1st layer, slowly pour in 1/4 cup of coconut milk cream in. 4. Fridge for 10 min for the cream to set. 5. Place the last layer of the cake on top of the 2nd layer, slowly pour in 1/3 of the coconut milk cream in . 6. Allow the last year to set in fridge for 15 min and pour all the reminding cream to the cake. 7. Fridge overnight to set. The reason to let the cream set in each layer ,as this is more a liquid cream then a buttercream. If you pour too much at one time the cake will float in the mould. So it does take some time for each layer to set properly. The taste is great. All the birthday boys love it. However, everyone can only have a slice of it. I think good thing sometime when is lesser it make the taste better.